Looking for any pointers for potential shops/suppliers of N gauge station lamps for my N gauge layout. Era will be late 70s/early 80s, BR Blue diesels. Attached are a couple of photos taken at my local station showing single and double lamps - I like these and it would be good to find something similar in model form. Also need tall lighting for my MPD. Sorry, but can't seem to add the jpegs at the moment..getting a rejection message each time from the forum, not sure why..
What size are your pics, Robin? They really need to be under 2MB. 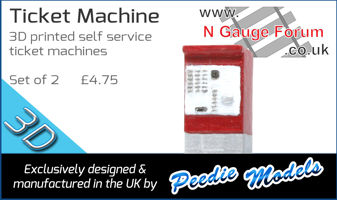 Type in 12v n gauge lighting, you will need plenty of time to go through everything! I should add that there are lots of UK suppliers as well. I have used layouts4u as mentioned by NPN. Not as cheap, but quicker.